Light Affection : "My humble beginnings are in the Manufacturing environment. Although I graduated as a Mechanical Engineer, design and art have always captivated me. For as long as I remember I wanted to have my own product and was looking for one that will involve creativity as well as be able to put my past experience to use. I was given the greatest opportunity to review a night light from Light Affection I chose my favorite picture of me and my husband when we was engaged at our equal friends house hanging out. She snapped a picture of us while we was loving on each other and it has been my favorite picture since. I chose this picture because i wanted something that my husband Jeff and i can admire together. Why am i talking about a picture? Read below. I don't know if you can tell but the picture above is now the carved picture shown as my night light! Yes! A night light! Amazing right?.. I thought so! They take the picture you send them (any high graphic picture) and carve a piece using a special technique they use. this is a amazing and memorable way to share special photos as a gift. With fathers day being this Sunday what better way to share memories then a light picture of you and your loved one. This is my night light plugged into the wall and lit up. It takes my breath away every time i see it. It is truly breath taking. It's like magic you go from a carved piece into a lit up picture. Your loved ones jaw's will drop when they receive this and turn on their own personalized standing light or night light. What better way to send off your recent Grad. to college then a personalized picture of the family, or a birthday girl? or for a baby shower. What better way to light up a new baby's room then a glowing picture of the newborn baby. The parents will be in Awe and will love you forever. You can buy your own personalized night light for $44.95 (well worth it!) If you are wondering what the carved pieces are made of : For the carving they use a modern material which is a blend of natural materials and a polymer. It is extremely durable and shouldn't change or crack with time. 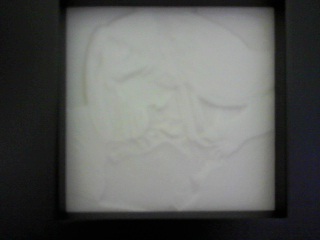 The original lithophanes are made out of porcelain which is extremely delicate. They were looking for a more durable material but one that will still have a high quality look and feel to it. ♥ I receive no monetary compensation for this review. I was provided a Light Affection night light to try and give my honest opinion.